I behold you, beautiful one. I behold you, child of the Earth and Sun. Let my love wash over you. If I could depict G Day in its purest essence, I would describe a wide, sunlit stairwell lined with parents and other caring adults, singing this refrain over and over again as the girls ascended towards our closing circle. The looks on the girls’ faces ranged from shyly confused to dazzled, as they took in the song and waves of emotion surrounding them. An adult friend who was also there wondered what it must have been like for them. I replied that it was unlikely that they – as is the case for most of us – had ever experienced anything quite like this love-filled tunnel of sound. How many of us have been sung to, let alone in such a unique and intentional way? How many of us have ever been so lovingly and intentionally beheld, as opposed to just seen? What impact it might have for them, I can’t say: I only know that it’s one of the most beautiful things that I have had the good fortune to witness in my lifetime. I further speculated that the waves of sound create a different imprint than, say, something written or spoken, however sincerely. It was also loud, in the most wholesome, hearty (heart-y!) way. As for the singers, their tear-streaked faces told the story of the depth and truth of their words. G Day takes its name from Girls, however its magic is not limited to them. As part of our “it takes a village” approach, we include parents and other supportive adults in girls’ lives, a skilled volunteer team, and experienced presenters and facilitators. Every person who forms part of our team has made a highly conscious decision to be there. A very special example of this type of infectious, “Village” energy can be seen in Lux Insights, our Community Partner for this event. When I was initially approached by one of their staff about getting involved with G Day not only as a Sponsor, but further as a way to engage their team as a group, I was a bit hesitant: it wasn’t something that we had ever done before and I was wary about opening up G Day in this way. But their enthusiasm and true understanding of our goals – thankfully! – soon won us over, and their team of 8 formed the core of our volunteer team for the day. We <3 Lux!! Here’s a beautiful reflection on the day from their Founder, Claire Booth. Often even the staff of the venues we use (in this case, the gorgeous Polygon Gallery) also get swept up, as in the case of a spontaneous pre-program huddle that happened to include Mike the AV guy, a couple of young volunteers, our MC, one of our Circle Leaders, and a Presenter. 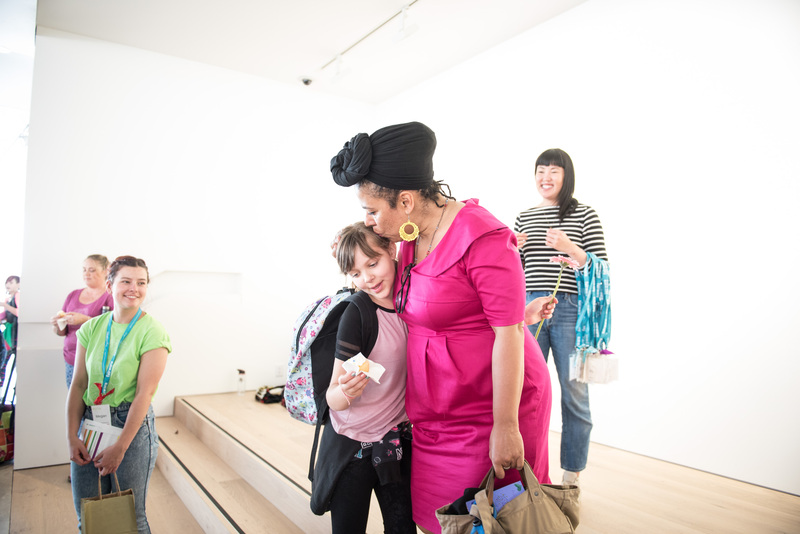 We put our arms over one another’s shoulders and listened to the words of our wise and gifted leader – the one and only Vanessa Richards, a community engagement goddess and choral wizard, who set our intentions for the day. It was a spontaneous moment of pure magic. Speaking of Vanessa, I would be remiss in not offering particular gratitude for her leadership of the day. Her skill, love, energy and confidence held everyone’s hearts and minds from start to finish, and it was heart-warming to see the girls approaching her for goodbye hugs and thank yous. She and the adult program MC Tamara Cotton were my co-pilots as the “emotional architects” of the day. 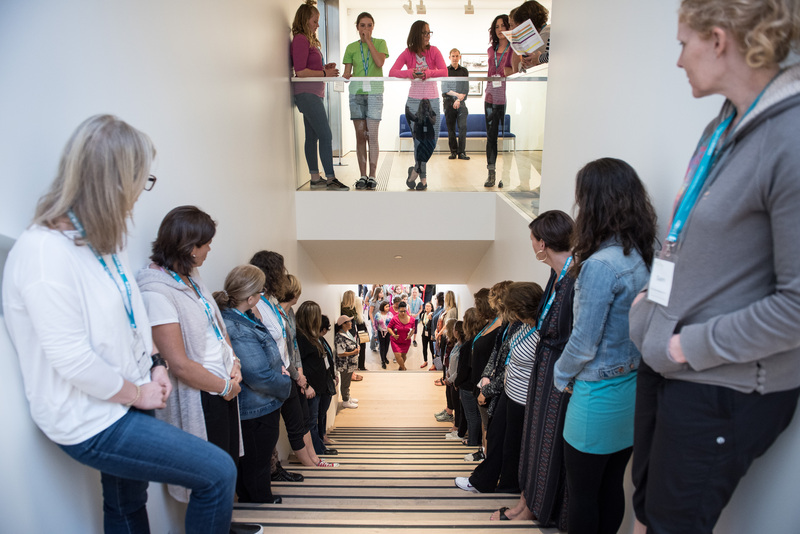 I should also mention that the stairwell song activity was inspired by a similar stairwell activity that Vanessa created for G Day Vancouver 2017. 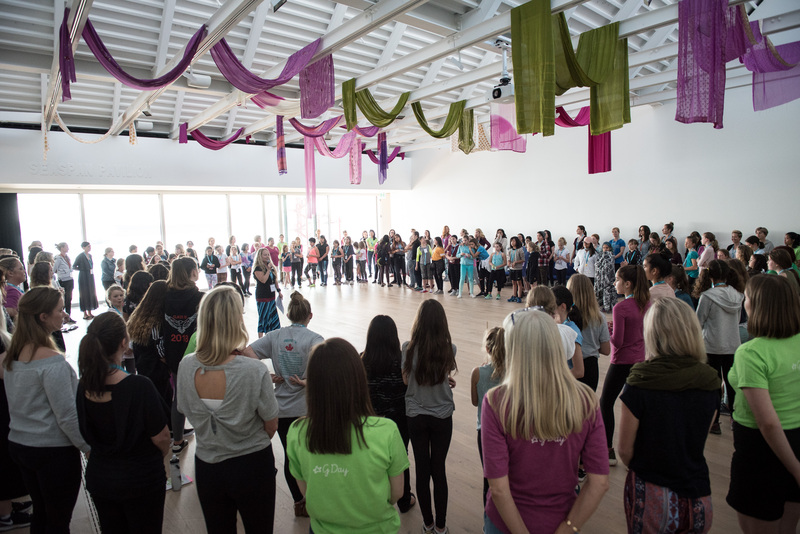 It merged perfectly into our closing Circle, where Tamara led us in a moving yoga-inspired affirmation that we are stronger together.